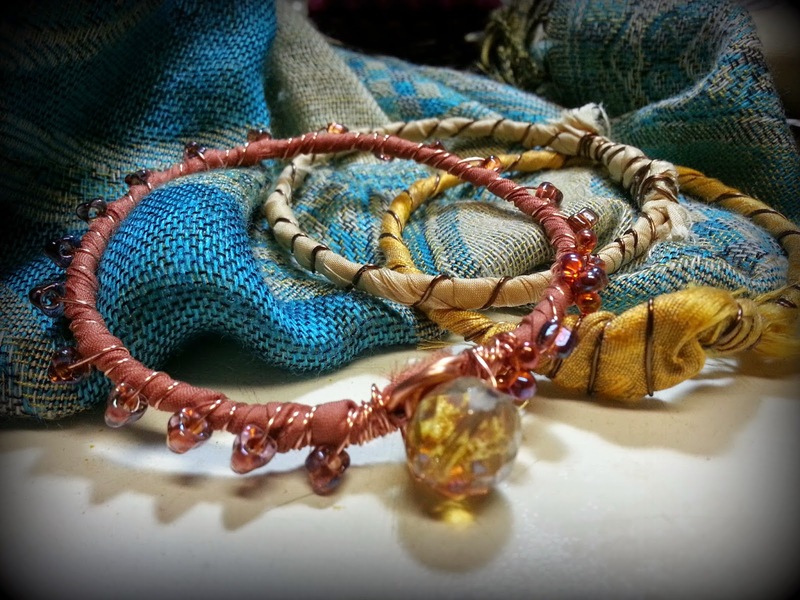 Yes, it has been a whole year since I participated in the Bead Soup Blog Hop. This one was really challenging and a lot of fun. The soup simmered in my craft room for several weeks until I decided what I really wanted to do with some of it. But first let me introduce you to my swap partner....her name is Dana also and she is a wonderful wire artist. You will be able to see that from the focal she made from my soup. Please visit her blog to see what goodies I sent her and what miracles she was able to work with it. 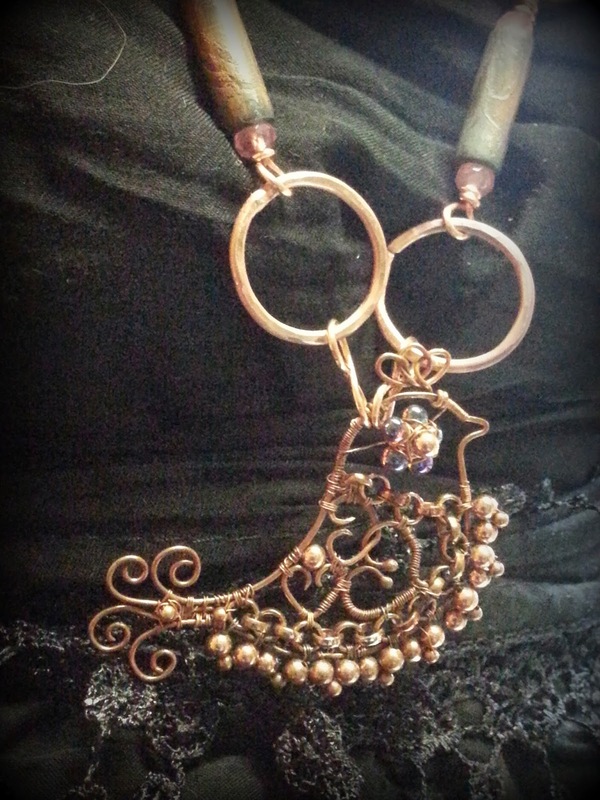 Have fun taking a look at her wonderful creations at Winddancer Studios. 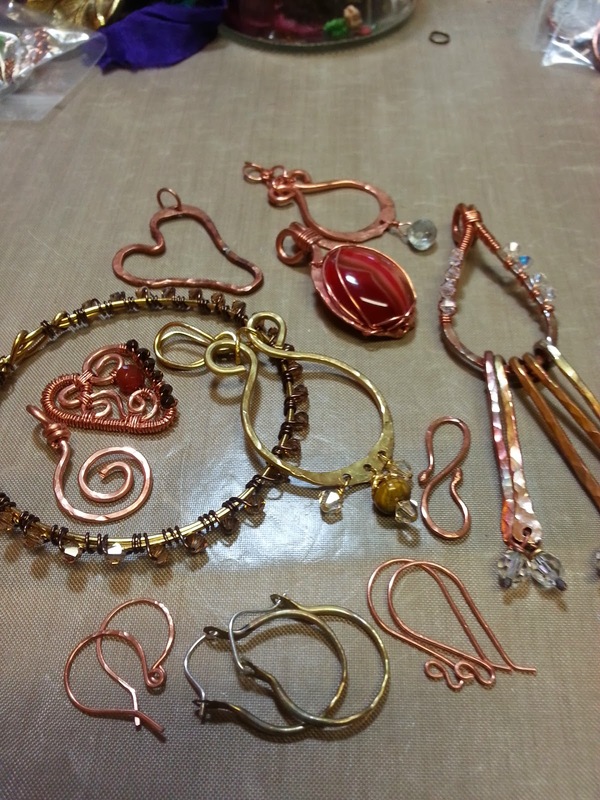 As you can see there is a lot of copper metal pieces which I love but I have never worked with the lightweight pieces before. Love the Birdy and it definitely became the focal of one of my pieces. This first piece came about as I was working up a class project for a winery where I'll be teaching. 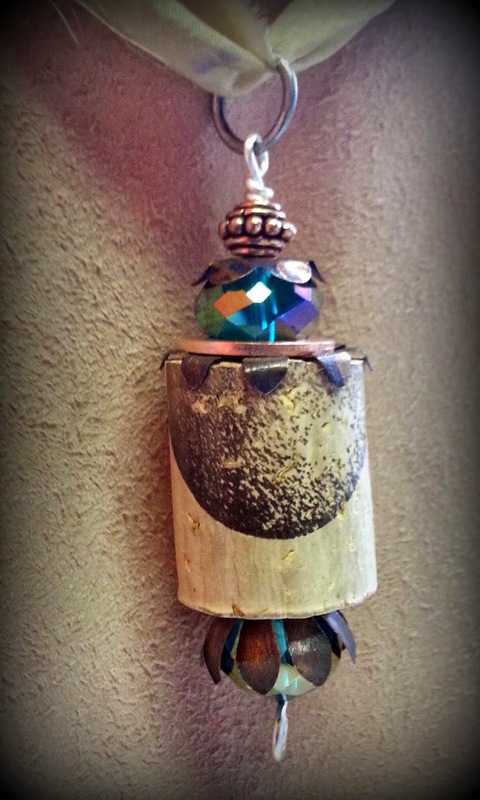 They wanted something wine related and I thought of corks, then I pulled out some of Dana's goodies that she sent me and was inspired to make this little cork pendant. 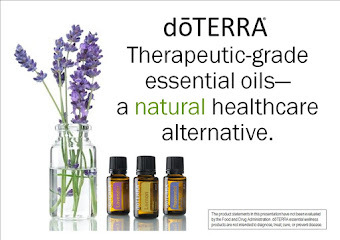 This is a just a sample of what I'll be teaching at the Scatter Creek Winery on June 21st. 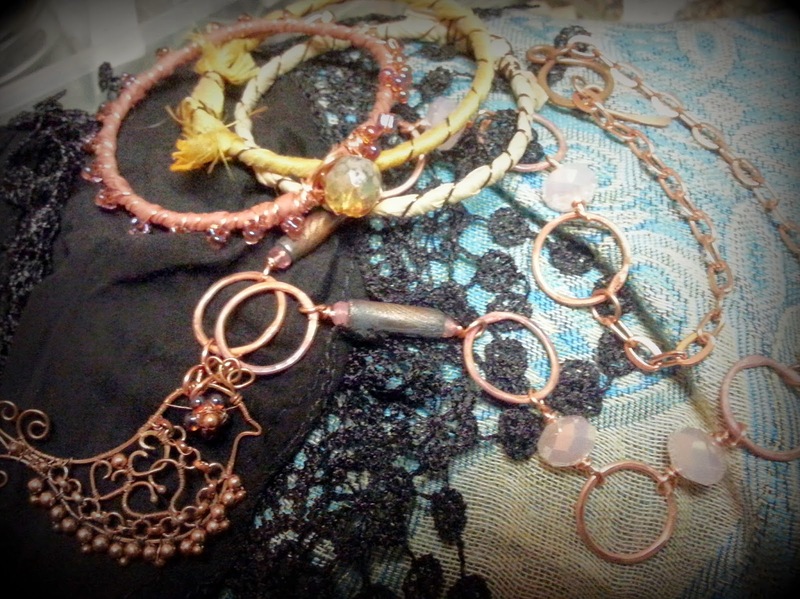 I used some of the crystals and the light weight copper pieces. I love how the bottom copper piece makes it look like a flower on the bottom. 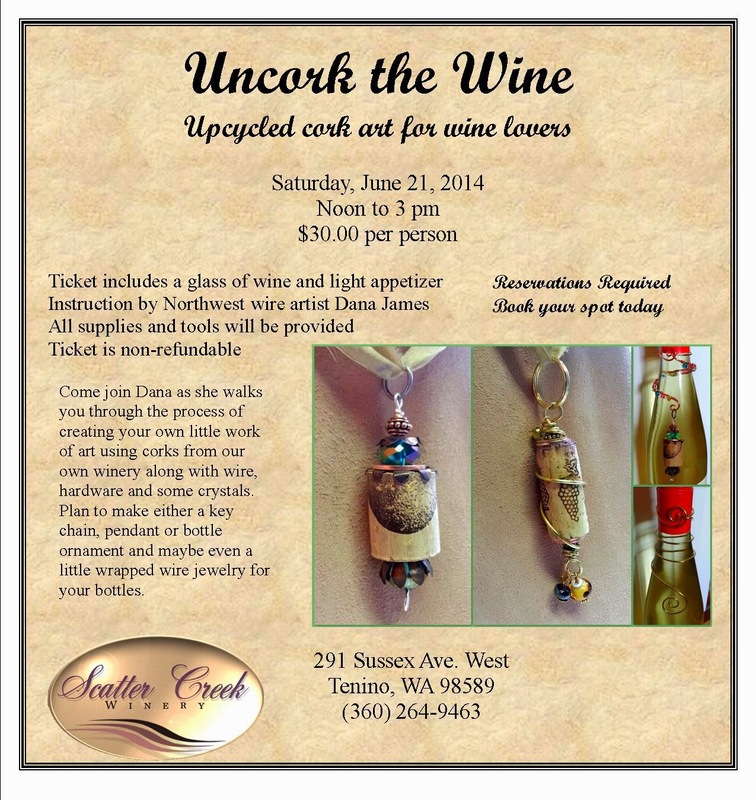 Here is the winery info and you can see this piece is pictured prominently on the flyer. These next pieces I plan to wear as a set. I think they look rustic/bohemian/feminine all at the same time. This is a close up of the focal. Isn't the wire work wonderful. The bracelets. The one on top I used some of these wonderful triangular shaped beads around the bangle with one large bead on top. The other two are just wrapped with the sari silk that I'll layer. The necklace showcases Dana's wonderful wire bird. 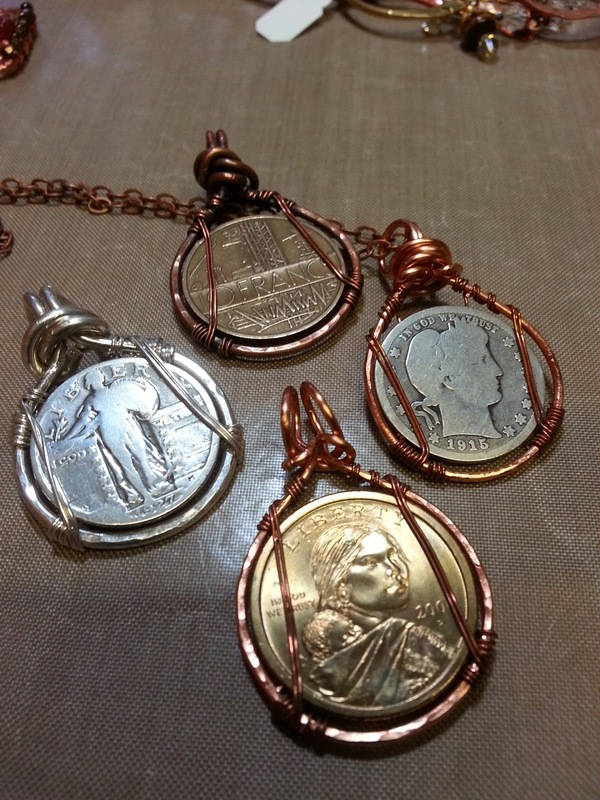 I even dared to try fusing some copper 14 gauge links. That was fun. I probably need a bit more practice with that. All in all this was a fun soup to work with and I have lots of pieces left that I can play with. I still have to make earrings and I'm thinking I really like those etched copper tubes and I just happen to have a couple left...so maybe a new pair of earrings are in my future. If you are ready to view a lot more blogs with beautiful creations, head on over to Lori Anderson's Pretty Things blog and she has the giant list of participants. Happy blog hopping and thanks for dropping by. I haven't been really good at blogging for the past year...need to get better. Humm, maybe I should have made that a resolution. Nah, probably wouldn't have worked but I can strive to be better. Lots of changes happening. My ArtFire studio has changed from Dana's Jewelry Design to Sano Therapia but I do still have my Dana's Jewelry Design.com site. Most of the jewelry I make these days are commissions so I really didn't see the need but didn't want to give up my cheap affordable ArtFire studio so I'm changing it to incorporate a little bit of jewelry and a lot of my homemade lotions and ointments. 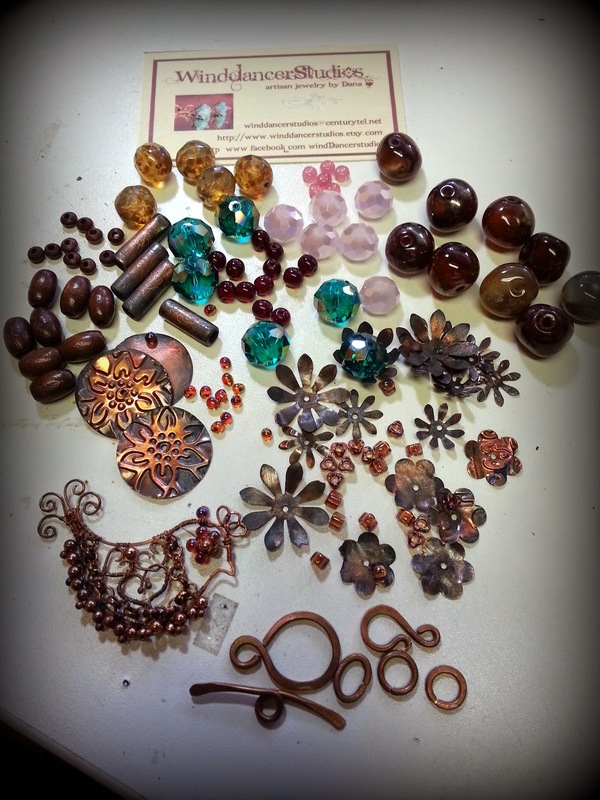 I'm still teaching at Shipwreck Beads at least 3 times a month so you can find me there and we have loads of fun. 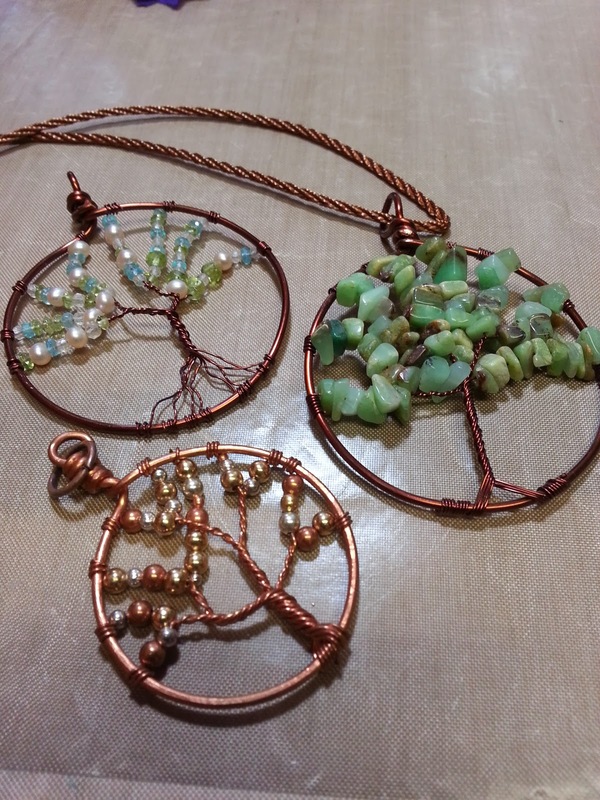 New classes this year is a Wire Workshop, Captured Coin and Tree of Life Pendant. I made a few more this past weekend in class. Very fun to do. When you have a favorite coin that you want to preserve. 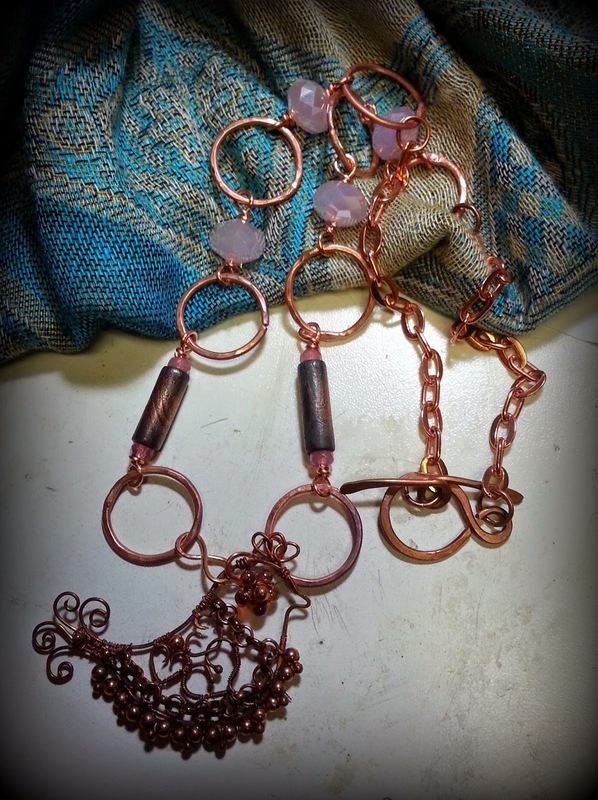 This class is great for anyone wanting to learn more about working with wire. I will be participating in Lori Anderson's Bead Soup Blog Party. It's always so much fun getting to know other jewelry artists and swapping beads. It is that time of year when Lori Anderson of Pretty Things organizes a great big blog party for all of us jewelry artists, designers, bead makers and bead weavers. She matches us all up and then we send a little bead soup which includes a focal, clasp and a few beads. This year there is 3 reveal dates as there are so many that signed up and this really makes it easier for us to visit all the blogs when there are spread out. My partner is Leslie from Twisted Chicken...don't you just love that name. Leslie makes some of the coolest lampwork beads and I got to play and create with some of them. I feel so blessed that she was my partner. Here is what I started with a bright mix with lots of lampwork and one that is more subdued (which is actually more my style) in purples and greens. I decided I wanted to make something out of each soup mix and started with the green and purple and especially that round focal lampwork piece. 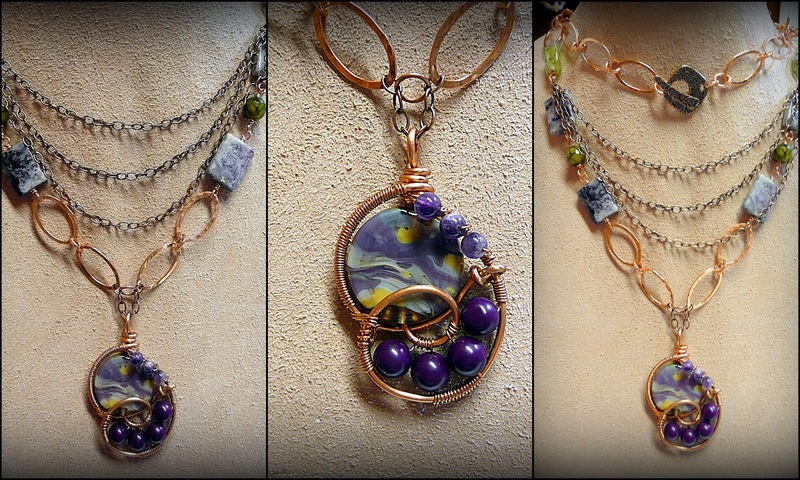 I made the pendant first with a little wire work and then added in a few of the beads that blended well. I'm loving how the pendant turned out. The bright lampwork beads I decided to use in a bracelet and wanted something fun and a little funky. I'm pleased with how both these pieces turned out and can't wait to see what everyone else did with their bead soups that they received from their partners. Be sure to visit my partner Leslie and she what she did with the soup I sent her and then have fun and visit all the other participants.